DESCRIPTION: The steam packet cover shown in figure 1 is the United States 3 cent red on buff paper embossed stamped envelope issued in 1854, postmarked with blue WETUMPKA/JAN 21/ALa circular date stamp, canceled with blue 7-bar diagonal grid handstamp, marked with a large black STEAM/HOPE/PACKET handstamp, and addressed to New Orleans, Louisiana. APPARENT USAGE: : Given to or mailed aboard the steam packet Hope on the Alabama River system, delivered by the packet purser to the United States Post Office at the packet stop in Wetumpka, Alabama, and forwarded at the 3 cents per half ounce letter rate in the domestic mails to New Orleans, Louisiana. 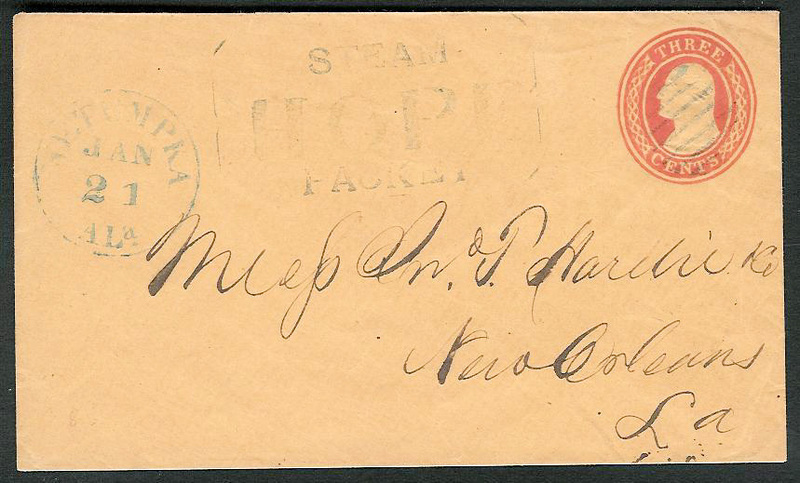 ANALYSIS: The U.S. 3 cent red on buff paper embossed stamped envelope of 1854 is genuine. The blue Wetumpka, Alabama circular date stamp and grid cancel is consistent in size and color with other markings from this period and, as such, should be considered genuine. The black packet marking of a large, octagonal type measuring approximately 58x34mm is highly questionable and most likely fake for several reasons. First, the use of a Wetumpka circular date stamp is unknown in combination with any name-of-vessel steam packet marking from this or any other period. Second, there are no known references to a steam packet Hope during this time period operating in or near Alabama waterways. Of the several steamboats named Hope, there were only two which fit the time period of this cover, that is, after 1853 and before 1861 which is the period of use of this particular embossed stamped envelope. The first was a 193 ton boat built in 1855 at Louisville which operated out of New Orleans on the Red River. The second was a 218 ton vessel built in 1859 which operated on the lower Mississippi River. A third steamboat named Hope operated in the Louisiana bayous in 1849-50 before the time period of this cover. Even though many of the smaller steamboats were tramp steamers traveling wherever business took them, there is no indication that any of the steamboats named Hope were used on Alabama rivers. Third, the size and character of the name-of-vessel marking is in itself questionable. The design and type face used in this marking are both exceptions to recorded genuine purser marks, and the octagonal box is not representative of other contemporary steam packet markings. The type face is similar to that used during that time, but the alignment and thickness of the letters suggest that it was created with individual letters placed in a holder. Note the uneven alignment of the letters. The general thickness of the individual letters is not representative of set type or carved characters and were probably rubber. Even though many name-of-vessel handstamps were rather crude, a careful examination of the letters contained in this marking are not consistent with contemporaneous type fonts. The design of these letters does not match those used in the 1850s, and this marking appears to have been made with a hobbyist’s rubber stamp kit. Finally, Wetumpka was the last and northernmost landing on the navigable Alabama River system in the 1850s, being 437 miles from Mobile and 34 miles up river from Montgomery. The source of the Alabama River is the confluence of the Coosa and Tallapoosa Rivers, and Wetumpka was actually about 10 miles up the Coosa River above the head of the Alabama River. However, the Coosa River was not navigable for some 137 miles above Wetumpka. Consequently, a cover postmarked in Wetumpka with any steamboat marking would have to have traveled up the river to Wetumpka from the direction of Montgomery. Before reaching Wetumpka, the steamboat purser would have to have applied the packet marking and then delivered the letter to the Wetumpka Post Office. One wonders why anyone would send a letter for New Orleans via a steamboat going up the river when any steamboat heading down the river would be faster. Such a scenario is unlikely. It would seem the faker of this cover was not knowledgeable about navigation on the Alabama and Coosa Rivers in the 1850s. CONCLUSION: This cover is a genuine embossed stamped envelope originally mailed at Wetumpka, Alabama, addressed to New Orleans, Louisiana, to which a fake boxed black STEAM/HOPE/PACKET marking has been added.